still wait by the window. Oh, what a wonderful photograph! 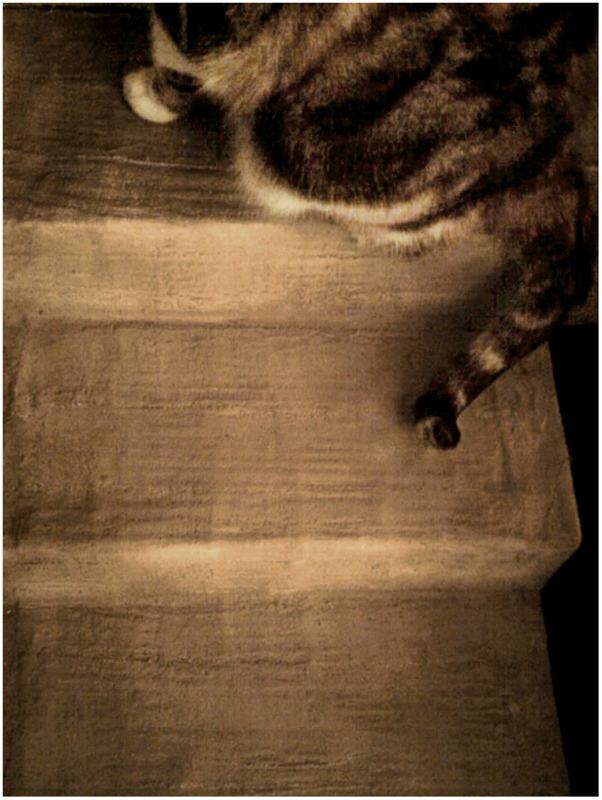 Love the sepia-ness and Lilycat's pattern. I love kitty paw photos and was so moved and grateful to find a random one of Mr. Cat in the mini-blinds - I'm convinced kitties wear at least part of their hearts in their paws. Love this little poem of a post. The way you express yourself is delightful. Take care. I hope they are wrong and that the sun comes out for you tomorrow. It is amazing what you can convey in so little words. And that little curl at the end of her tail tells many stories too. Well perhaps I don't wait by the window, but I've been known to get up during the night just to have a peek outside. Ohhh...how I love this. Yes. You have such an incredible way of taking the smallest, fleeting moments - looking for the first snowflake of a forecasted snowstorm - and putting it into words that take the breath away. You are such a talented writer.